KAIST KI-ITC 증강현실연구센터(ARRC)에서 제29회 증강현실연구센터 콜로키움을 아래와 같이 개최하였습니다. 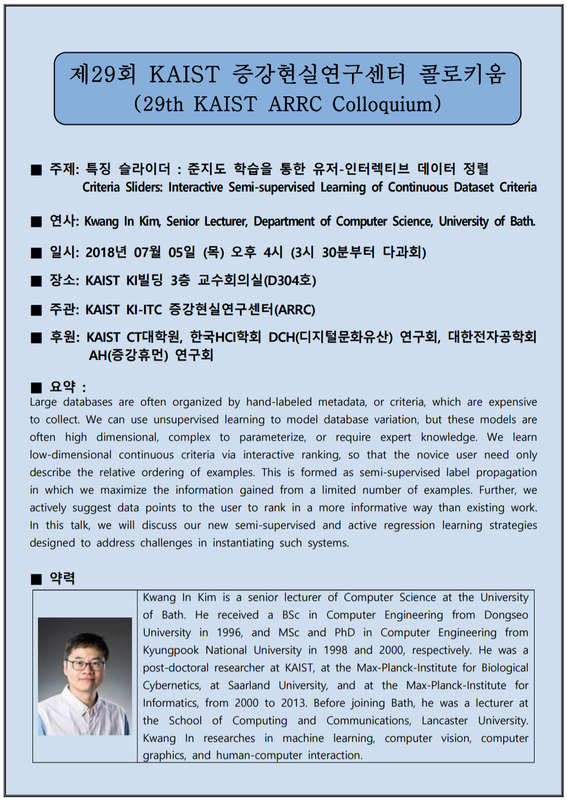 ■ 연사: Kwang In Kim, Senior Lecturer, Department of Computer Science, University of Bath. Large databases are often organized by hand-labeled metadata, or criteria, which are expensive to collect. We can use unsupervised learning to model database variation, but these models are often high dimensional, complex to parameterize, or require expert knowledge. We learn low-dimensional continuous criteria via interactive ranking, so that the novice user need only describe the relative ordering of examples. This is formed as semi-supervised label propagation in which we maximize the information gained from a limited number of examples. Further, we actively suggest data points to the user to rank in a more informative way than existing work. In this talk, we will discuss our new semi-supervised and active regression learning strategies designed to address challenges in instantiating such systems.